Welcome! Thank you for taking the time to visit. I’m C.J. Pastore and I write romance books. Have you ever thought about how the building blocks of compatibility and desire are sculpted? I consider and observe what takes two people to the next level of physicality and emotion. Then, I create characters who struggle with these cornerstones of love. So, kick back, enjoy and come explore a reality of fearless love, passion, conflict and second chances. It’s not just romance, it’s life. Growing up is hard. No one knows that better than Alicia Cesare. As a child, Alicia struggled to free herself from the cloying shadow of her mother's depression and the overprotectiveness of a meddlesome family. With a top-selling fashion design and a passionate relationship with New York City real estate mogul Chase Reardon blossoming, being an adult isn't so bad . . . until she's viciously attacked by a Russian drug lord out for the blood of anyone that matters to Chase. Now, under constant surveillance from family or a team of ex-special-ops Marines, Alicia remains determined to maintain her freedom and grow her brand. This does not sit well with Chase who sees Alicia's behavior as reckless and as much of a threat to her safety as the vicious gangster himself. Chase thought his service to the United States ended, but when he's called to duty, he readily responds. What's meant to be a simple mission unravels into a dangerous separation for both. Nothing could have prepared Alicia for what was to follow. Trapped in a web of lethal reprisals and on her own for the first time, Alicia struggles to protect herself and those she loves while balancing independence and the transcendent force of unconditional love. C. J. Pastore lives in Manhattan with her husband and two children. When not pounding the keyboard and writing, she enjoys teaching, jogging, and reading. Elena Ferrante’s, My Brilliant Friend series and Henry and June by Anais Nin are just a few of many favorites. C.J. Pastore appreciates the raw writing of authors who have the courage to bare it all on the written page. The enjoyment of travel is a necessity for C.J. Immersing herself in other cultures, laughing, eating, and drinking with the local populace are favorite pastimes. Intrigued by the cornerstones of love, C.J. often records people’s answers to its essence and the hurdles that must be overcome to ensure that second chances spell success. She holds true to Anne Frank’s belief that “people are really good at heart,” and deems that whether walking in your own neighborhood or traversing the globe, the kindness and well-meaning wishes of others can be absorbed and reflected. As a former writer of curriculum and teacher mentor, C.J Pastore has published in TESOL Journal and Social Studies and the Young Learner. Articles on the global rights of children and letters on literacy have been published in The Citizen. Captive of a Commoner (order here) Book I in the Commoner series, is her first foray into the world of romance writing. 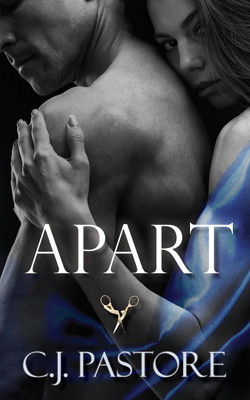 Apart is Book 2 of the Captive of a Commoner series.